In what's almost certain to be his final meeting with the A-list group overseeing English-language liturgical translations, Cardinal Francis Arinze (front center) sat for a photo with the Vox Clara Committee at its final sit-down of the year earlier this week in Rome. As previously indicated, Arinze -- who turned 76 last month -- is widely expected to retire in short order, to be replaced by the Spanish primate Cardinal Antonio Cañizares Llovera of Toledo at the helm of the Congregation for Divine Worship and the Discipline of the Sacraments, where the buzz likewise continues surrounding the likely transfer of the dicastery's #2, Archbishop Malcolm Ranjith (rear center), back to his native Sri Lanka and his home-see of Colombo. Notably absent from this week's gathering at Culto Central was one of the committee's vice-chairs, Cardinal Oswald Gracias of Mumbai, whose city continues its initial stages of grief and recovery following last week's terror attacks. The Vox Clara Committee met for the sixteenth time from December 1 - December 3, 2008 in the offices of the Congregation for Divine Worship and the Discipline of the Sacraments in Rome. 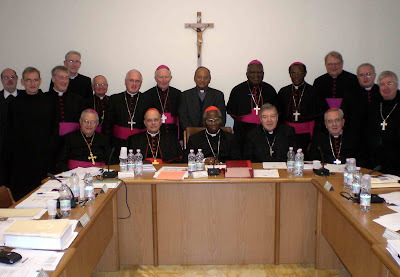 This Committee of senior Bishops from Episcopal Conferences throughout the English-speaking world was formed by the Congregation on July 19, 2001 in order to provide advice to the Holy See concerning English-language liturgical books and to strengthen effective cooperation with the Conferences of Bishops in this regard. The Vox Clara Committee is chaired by Cardinal George Pell, Sydney (Australia). The participants in the meeting were Archbishop Oscar Lipscomb, Mobile (USA), who serves as First Vice-Chairman; Cardinal Justin Rigali, Philadelphia (USA), who serves as Treasurer; Cardinal Francis George, O.M.I., Chicago (USA); Archbishop Alfred Hughes, New Orleans (USA); Archbishop Terrence Prendergast, S.J., Ottawa (Canada); Archbishop Peter Kwasi Sarpong, Kumasi (Ghana); Archbishop Kelvin Felix (Dominica) and Bishop Philip Boyce, O.C.D., Raphoe (Ireland). Also members of the Committee, though not present at the meeting, are Cardinal Cormac Murphy-O’Connor, Westminster (England), who serves as Secretary and Cardinal Oswald Gracias, Bombay (India), who serves as Second Vice-Chairman. The members were assisted in their work by the following Advisors: Abbot Cuthbert Johnson, O.S.B. (England), Monsignor Gerard McKay (Rome), Reverend Dennis McManus (USA), Reverend Jeremy Driscoll, O.S.B. (USA), and Monsignor James P. Moroney (USA), Executive Secretary. The support and assistance of officials of the Congregation was once again gratefully noted. The meeting was primarily devoted to a careful review of the ICEL Gray book for the Proper of Seasons, as recently approved by several of the English-speaking Conferences of Bishops. The members were gratified by the high quality of amendments offered by the Conferences and frequently noted their capacity to improve significantly the precision and proclaimability of the texts. The indispensible role played by the Conferences of Bishops both at the stages of consultation and final amendment and approval has borne great fruit. With this meeting, the Vox Clara Committee has completed its recommendations to the Congregation concerning the Proper of Seasons, the largest and most challenging of the segments of the Roman Missal. With eight further Gray Books pending consideration by the Conferences of Bishops, the members noted the pastoral imperative of completing this project as expeditiously as possible. Methods by which the Congregation could support the Conferences in these important last stages of their work were explored, along with ways in which a rapid confirmation of the entire Missal could be assured once all the segments have been approved. In its meeting with Cardinal Francis Arinze, Prefect of the Congregation for Divine Worship and the Discipline of the Sacraments and Archbishop Albert Malcolm Ranjith, Secretary of the Congregation, the members thanked the superiors of the Congregation for the recent confirmation of the Order of Mass, the first of the segments of the Roman Missal to be approved. In expressing his gratitude for the work of each of the Conferences of Bishops, the Prefect noted, in particular, the helpfulness of the amendments received from the United States Conference of Catholic Bishops. While thanking the members and advisors for their continuing advice to the Congregation, the Cardinal expressed his hopes for an expeditious completion of the work. The members of the Committee concluded by renewing their commitment to a completion of the Roman Missal in the near future. The Committee will meet again in August 2009 in Rome.